Over the past few years The Pandora Inn has been both a national finalist for the wine category in The Great British Pub awards and winner of the St. Austell Brewery estate awards for ‘Best Wine Pub’. In recognition of this owners John Milan and Steve Bellman, along with managers Catherine and Lester Croft, were taken to Champagne courtesy of the lovely people at Joseph Perrier. 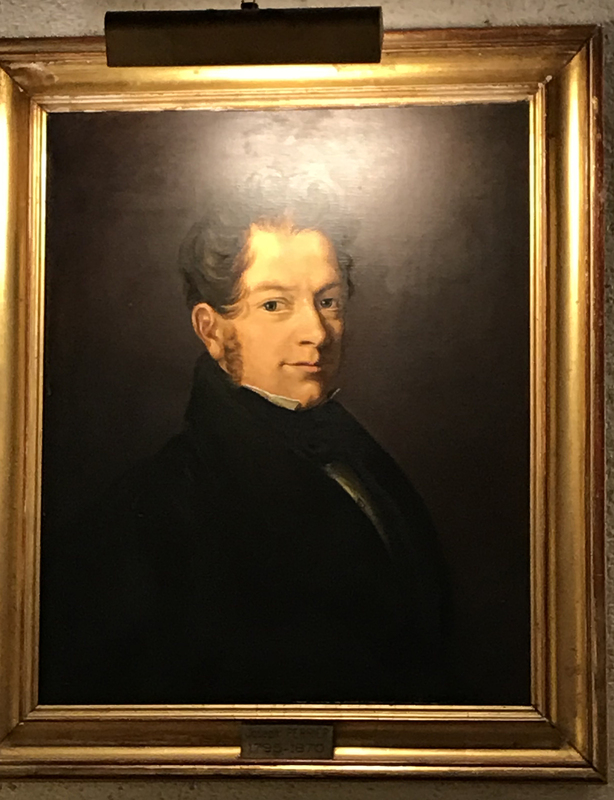 Family portrait – this is Joseph Perrier himself! 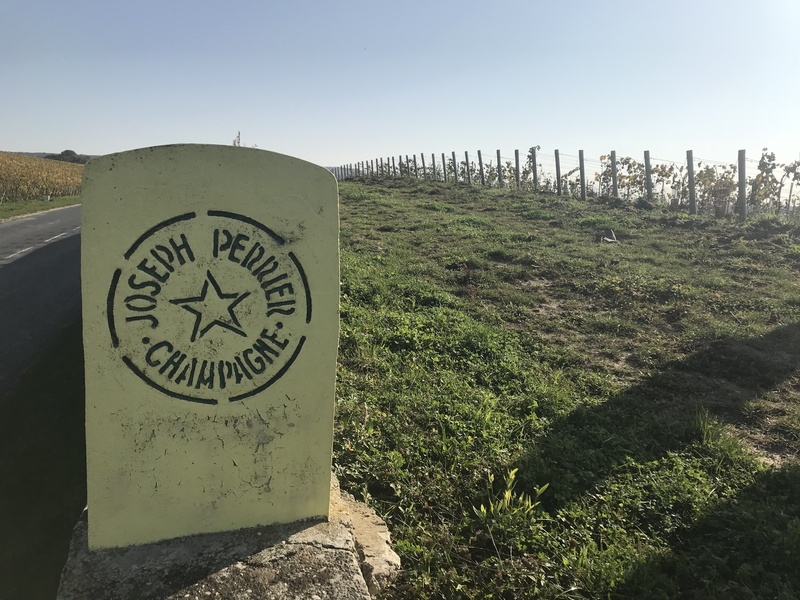 Founded in 1825, Joseph Perrier is a small family owned and run Champagne house producing around 750,000 bottles a year. Its 21 hectares vineyards, sited on south facing slopes overlook the Marne river, and are planted with the three classic grapes Pinot Noir, Pinot Meunier and Chardonnay. The vines are carefully picked by hand into small baskets to ensure that each grape reaches the press in perfect condition. It was a real treat to visit this famous Champagne producer and their attention to detail and care in cultivation and production was really interesting to see first hand. It was also something of a treat to sample the Champagne! The Joseph Perrier head office, including the cellars, are carved out of the limestone rock and maintain a constant ambient temperature of 11ºc all year round without the use of any energy. A side cellar which houses the earliest bottles they have, from 1946 onwards. When France was invaded during World War II, the city where Joseph Perrier is based was not defended and, after the war when the family and workers returned, the cellars had been emptied. The storage of the Champagne – 2nd fermentation (to create the fizz) takes place in the bottle – to qualify as Champagne it must be aged like this for a minimum of 15 months but Joseph Perrier keep theirs in the cellars for a further three to four years minimum which develops into a better and more rounded flavour. Some of their bottles are still hand turned to separate the sediment prior to the final cork and traditional metal cage going on. Joseph Perrier produce nine different Champagnes! They first make still white and still red wines from three main grape varieties – Chardonnay, Pinot Noir and Pinot Meunier – two of which are red grapes but they make white wine from these by separating the colour bearing skins early in the pressing process. Rosé Champagne is not made from red grapes – it is white or normal coloured champagne to which they add a % of red wine to give the desired colour and flavour profile.